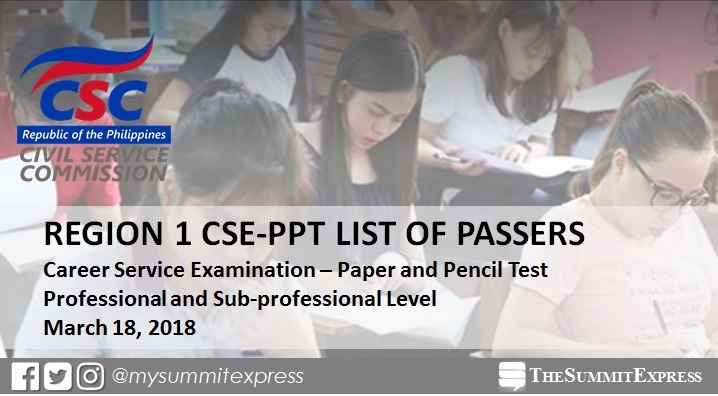 MANILA, Philippines – Those awaiting results of March 2018 Civil Service Exam-Paper and Pencil Test (CSE-PPT) also known as Career service examination can find here the complete list of passers for Region 1 as announced by the Civil Service Commission (CSC) in 59 days after the exam. "The list of passers shall be uploaded/posted on the CSC website www.csc.gov.ph within 60 days after the examination," CSC has confirmed on Facebook. The first CSE-PPT this year was conducted on March 18 (Sunday) in 61 testing locations throughout the country. More than 200,000 examinees tried to hurdle the eligibility exam, designed to measure an individual's preparedness to enter government service. View on this page the passers for professional and sub-professional levels for the following provinces of Region 1: Ilocos Norte, Ilocos Sur, La Union, Pangasinan. Examination results will be posted on CSC website www.csc.gov.ph and on this page once announced online. The list of passers can be expected from May 15 (Tuesday) to May 17 (Thursday or 60 calendar days after the exam). Takers, both passed and failed, may get their individual test results using the OnlineCivil Service Examination Result Generation System (OCSERGS), which can also be accessed through the CSC website. Note: The date of OCSERGS availability will be posted here soon but you may expect approximately 15 days after the posting of the List of Passers.